Water Water — Where Is Water !!! World Water Day 2012 has HERE and you have to think what have you been doing to SAVE WATER. I know you are aware how important is to save Every One Drop. Much water is needed TODAY to create our meal, while ensuring that we get the nutrition we need. And Thus The Success Of World Water Day Depends On You. There are 7 billion people to feed on the planet today and another 2 billion are expected to join by 2050. Statistics say that each of us drinks from 2 to 4 litres of water every day, however most of the water we ‘drink’ is embedded in the food we eat – producing 1 kilo of wheat ’drinks up’ 1,500 litres. At all steps of the supply chain, from producers to consumers, actions can be taken to save water and ensure food for all. And you? Do you know how much water you actually consume every day? How can you change your diet and reduce your water footprint? How much water is needed to produce our food? All the food from crop and livestock production, inland fisheries or aquaculture, forest products, requires water. This water comes from rain and moisture stored in soils (green water) or from withdrawals in watercourses, wetlands, lakes and aquifers (blue water). 70% of the blue water withdrawals at global level go to irrigation. Irrigated agriculture represents 20% of the total cultivated land but contributes 40% of the total food produced worldwide. It takes about 1500 liters of water to produce 1 kg of wheat, but it takes 10 times more to produce 1kg of beef! Producing feed crops for livestock, slaughtering and the processing of meat, milk and other dairy products also require large quantities of water. This makes the water footprint of animal products particularly important. Fish production from rivers and, increasingly, from aquaculture contribute about 25% to the world’s fish production and aquaculture is the fastest growing food producing sector: the average annual per capita supply of fish from aquaculture has increased at an average rate of 6.6% per year between 1970 and 2008. Both fisheries and aquaculture require a certain quantity and quality of water in rivers, wetlands, lakes and estuaries and are therefore important water users. How is the global demand for food evolving? There are over 7 billion people to feed on the planet today and another 2 billion are expected to join by 2050. 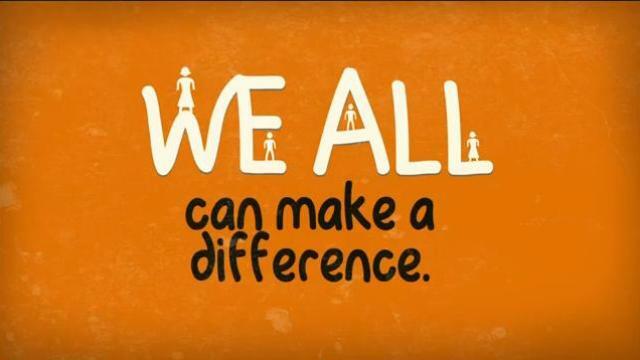 This means that 70% more food will be needed, up to 100% in developing countries. Besides, with rapid urbanization and incomes increase, diets are shifting. Meat consumption in particular is expected to rise from 37 kg per person per year in 1999/2001 to 52 kg in 2050 (from 27 to 44 kg in developing countries), implying that much of the additional crop production will be used as feed for livestock production. For example, 80 percent of the additional 480 million tons of maize produced annually by 2050 would be for animal feeds, and soybean production would need to increase by a hefty 140 percent, to reach 515 million tons by 2050. 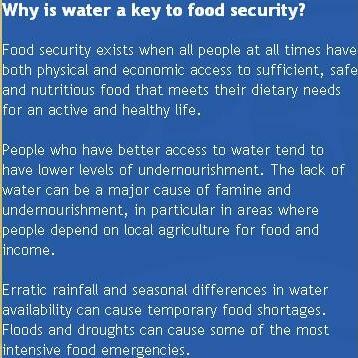 How does water scarcity affect our food security? Water scarcity already affects every continent and more than 40 per cent of the people on our planet. By 2025, 1.8 billion people will be living in countries or regions with absolute water scarcity, and two-thirds of the world’s population could be living under water stressed conditions. The lack of water limits farmers’ ability to produce enough food to eat or earn a living. South Asia, East Asia and the Middle East for example are already close to their resources limits, and their population is still growing. What effect does climate change have on our food security? Climate change is expected to impact both rainfed and irrigated agriculture, including feed and fodder for livestock, as well as forests and aquaculture. Severe reductions in river runoff and aquifer recharge are expected in the Mediterranean Basin and in the semi-arid areas of the Americas, Australia and Southern Africa, affecting water availability and quality in already stressed regions. High latitude areas will see an increase in their potential, whereas regions near the equator will experience more frequent and severe droughts, excessive rainfall, and floods which can destroy crops and put food production at risk. Populations who live in fragile environments and depend on agriculture for their livelihoods face an immediate and increasing risk of crop failure or loss of livestock. Is the competition for water increasing? With population increase and economic growth, water demands for cities and for the industry are growing much faster than those of agriculture. In some regions, increasing competition for water is constraining both current availability of water for irrigation and further expansion of the irrigated area. In agriculture alone, staples, livestock, inland fisheries and aquaculture, and non-food crops – including liquid biofuels – already compete for water resources. The steady increase of inland aquaculture also contributes to the competition for water resources. Increased competition for water often translates into loss of access to water for the poor and other vulnerable groups. For millions of smallholder farmers, fishers and herders, water is one of the most important factors of production: without water, they cannot make a living. How has the Green Revolution degraded our land and water while allowing to supply more food? The Green Revolution and its three pillars – high yielding varieties, chemical inputs like fertilizer and pesticides, and irrigation – has had a very positive effect on global food production but also had negative impacts on the environment. The way water has been managed has contributed to harm the environment: groundwater depletion; degradation and contamination of land and water; forest resources, ecosystem and biodiversity losses. A quarter of the world’s lands are degraded. Many large rivers run dry during part of the year, with serious impacts on aquatic biodiversity. Large lakes and inland seas have shrunk, and half of the wetlands of Europe and North America no longer exist. The number of regions across the world that cannot satisfy the basic food needs of their growing populations is increasing, and in many of these places the impacts on the environment are beyond repair. But can we produce more food with less water? The future production of food and other agricultural products will not be possible without increased efforts aiming at better using water in the fields. For a long time, progresses in agricultural production have been assessed in terms of ‘yield’, the amount of production that could be extracted from a given area of land. Now, in many places, maximizing the yield per unit of land should give way to achieving the maximum yield per unit of water used. This requires a better control and application of irrigation water, and a sharper combination of the use of rain and irrigation water, combined with good agricultural practices to ensure the highest possible productivity. Can we re-use and recycle water in food production? Drainage water, treated wastewater, brackish and desalinated water can be used in agriculture, especially in the arid and semi-arid zones and in rapidly growing peri-urban areas. Cities’ wastewaters are in fact a precious source of water and nutrients for agriculture that have to be properly managed to minimize environmental and health risks. Utilizing residues and by-flows of the food sector rather than growing crops specifically to produce bioenergy would limit the pressure on water resources and competition with food crops. It would even increase water productivity: the same water would have produced food AND bioenergy. Many forms of aquaculture such as cage culture, flow-through systems and integrated agri-aquaculture represent food productions systems that do not significantly increase water consumption. Recirculation of water in aquaculture can reduce water use by 90%. How can we protect this precious resource? Water pollution is a main cause of reduced water availability and can have serious impacts on the environment and on human health. Pollution stems for inappropriate industrial and agricultural practices as well as from urban waste production. In agriculture, overuse of chemical fertilizers and of pesticides leads to contamination of water bodies (rivers, lakes, underground aquifers). Intensive livestock production can also impact the quality of water resources if measures are not taken. New, more integrated approaches to food production can substantially improve the situation and limit pollution. Management of watersheds and the protection of water sources are also important. Forests can play an important role in protecting water resources. How can we prepare for climate changes and natural disasters? Adapting water management policies and practices to climate change and other natural disasters reduces the risk of these phenomena. Improved water harvesting and retention (such as pools, dams, pits, retaining ridges, etc. ), supplementary irrigation for rainfed crops, highly efficient irrigation systems and best practices are fundamental for addressing increasing irregularity of rainfalls, and increasing water productivity and food production. A particular saving potential exists for irrigated rice, which is currently flood irrigated leading to very high water use and at the same time to high greenhouse gas emissions. Changing rice cultivation to aerobic conditions can reduce the water use by 50%, while cutting emissions and increasing yields. Proactive drought and flood management strategies minimize the devastating impacts of these events, the frequency and severity of which is expected to increase with climate change. Are there ways to improve the integration of different food production systems and increase water productivity? Several integrated production approaches have developed that combine best practices in sustainable land and water management, adapted to the local ecosystems. They incorporate improved soil and water management techniques in a way that intensifies production through integrated soil fertility management, improved water-use efficiency and crop diversity. Integrated rice-fish farming is also a promising option. All these approaches offer opportunities for farmers to improve productivity sustainably. Finally, how can we reduce the waste? Roughly 30% of the food produced worldwide – about 1.3 billion tons – is lost or wasted every year. In many developing countries, large shares of the production are lost between the farmers’ field and the market because of poor storage and transportation facilities. In developed countries, and in particular in cities, food is wasted by the consumer who is not aware of, or sensitive to, the resources needed to produce it. Diets with excessive food intake are also a source of waste and a cause of growing heath costs. A change in consumers’ attitude towards this issue is necessary: limiting the waste means reducing the water needed to produce our food. If only we all would think about the future and save our environment……. If only people would think they way you think………. THE WORLD WOULD BE A BETTER PLACE…………..!!! …and only if we could we realise how people live in deserts and desert type environments! Thank you for this great post! Very helpful.